Biggleswade FC booked their first-ever cup final place with a battling 3-0 win at neighbours Biggleswade United at Second Meadow in the North Beds Charity Cup on Tuesday. Abraham Eze gave FC a 24th minute lead following good work from Ryan Inskip on the edge of the box. This was after Michael Simpson had heroically cleared one off the line for the visitors early on. Tom Cookman was the second FC player to come back to haunt his old club with a brilliant low finish from another Inskip through ball. 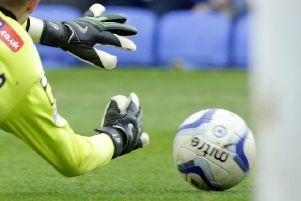 United won a penalty moments into the second half, but the excellent Ross Tompkins pulled off a fine save to deny Taylor Rhiney. Then to make matters worse for the hosts, FC increased their lead three minutes later when Eze played in Lee Northfield who ghosted inside on to his left foot before delicately clipping the ball over the onrushing Ollie Leslie. The home side gave it a good go to get back into the game, but Tompkins was absolutely at the top of his game for FC and the threat all but petered out when Liam Andrews was sent off for an off the ball incident around 15 minutes from time. 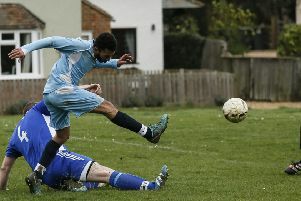 FC will play SSML Division One Ampthill Town in the final. FC’s match at Harpenden on Saturday was postponed as was United’s trip to North Greenford United, both due to waterlogged pitches. On Saturday FC host Colney Heath and United are at home to London Colney, both in the SSML.